She’s visibly angry. You’ve gotta let her stay that way for a while. . While doing some interviews for a story that i’m working on about the coverage of the shootings at the Emanuel AME Church in Charleston, South Carolina, I was interviewing my friend Brian Levin, who runs the Center for Hate and Extremism at California State University-San Bernadino. We got on the subject of how the victims have been viewed in the media in the case of the church shootings as opposed to how victims of police shootings are generally viewed. In fact, what’s stood out about this group of victims is how their loved ones have responded to Dylann Root, the man accused of the shooting, Levin said. Now as a member of a group of people that has turned the other cheek so much that we might need to avail ourselves of the same kind of group plastic surgery plan that gave Michael, Janet and the rest of the Jackson family all of those nice new noses, the Dixie Chicks “Not Ready To Make Nice” got stuck in my head almost as soon as I got off of the phone with Brian. That’s because I’ve seen too much of a focus on the grace of forgiveness and not enough on how to process the anger that you need to to get there. When it comes to the Black community, or communities of color period, there’s a demand for the kind of immediate healing that allows folks to avoid dealing with the things that made us angry in the first place. That the folks who lost loved ones in this racially motivated shooting were able to offer Roof a forgiveness he didn’t, and probably never would, ask for was significant. I’m glad that they were able to do that. Because, let’s keep it real here. The last post that I put on this blog was a post in which I talked about how tired I was with seeing people literally get away with murder because the person doing the murdering was a police officer. So if i was tired from seeing that kind of stuff, imagine how I feel now that we’ve added a 12-year-old kid getting shot to death by police for brandishing a toy gun, a 15-year-old girl dragged to the ground by her hair and handcuffed while attending a pool party, and seeing nine folks gunned down in a church by some joker who’s spent a little too much time sitting in front of the Stormfront website to the mix. And yet, when we take to the streets, demand that we be treated fairly as a people and make noise when we aren’t, we’re often told to chill. Calm down. Make nice. But making nice and calming down is generally what happens when you’ve been allowed to heal. Healing can’t happen if you’re not even allowed to be angry. If you want real healing, you can’t force it and you can’t demand it. That’s not how it works. That’s not how any of this works. 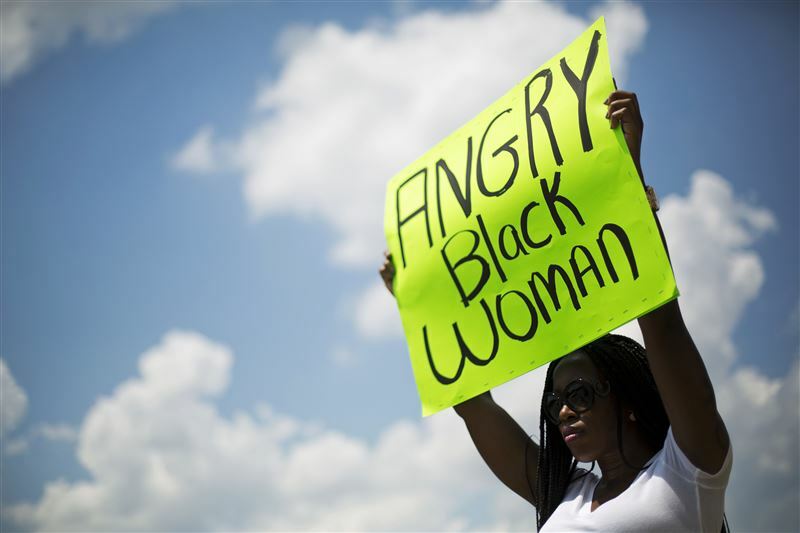 So to everyone who keeps telling me that I shouldn’t be an Angry Black Woman like the one holding the sign here, I say this. If you let communities of color go ahead and get mad, healing can begin and maybe through that healing we can start working on things like peace in our communities, the end of police brutality and the end of inequality. Remember: While Jesus is widely regarded as the Prince of Peace, he didn’t always make nice.